Yesterday I looked at my schedule for the next few weeks, and I laid it all out, and made it tidy, making itineraries, and printing schedules, and I made sure everything I need is (more or less) orderly and organized, and then I made a momentous and fantastic decision to be quiet. I love my job, and I’m pretty sure I’m going to love the way the next few weeks rolls out, but as someone who hates rushing and loves quiet time to think and write, I decided to take a day or two to fill my cup. Sort of an introverts version of putting on your own oxygen mask before helping someone else with theirs. I’ve spent all of yesterday and today reading, writing, touching base with my people, and quietly knitting socks. If I don’t snap over the next few weeks, I will owe it all to this idea. I feel pretty darned clever right now. For you, I’m sorry for the quiet. For me? The best ever. Great idea! I did the same thing yesterday (Friday). I call it a self-care day, spent it knitting, reading and catching up with things in a very relaxed way. It should be able to be written in a doctor’s prescription pad. My doctor actually does that! On occasion she’s forcefully told me to take the next day off, and written me a sick note to cover it at work. She says she’d rather see people come in for that when they’re stressed and under the weather, than several months later with an episode of depression/anxiety/burn out. She’s a good’un! Ah, Sadie. I had not thought through the yarn name until you mentioned it. That is laugh out loud funny. Thanks! I thought that the yarn name referenced the play “Waiting for Godot,” where two men wait during the entire play for a man named Godot – who never shows up. This yarn is so lovely! Enjoy the quiet. Well, the Buffy line is a reference to “Waiting for Godot,” so the yarn name is, too, but at one remove. In “Buffy The Vampire Slayer” Buffy says it about another slayer, Faith. All of the 716 yarn names are Buffy related and that is not even the best part, the yarn is fantastic! It’s being deliberate about it that makes all the difference. Breathe, rest, take your time to just be. And enjoy the beautiful outdoors with your knitting. Now that sounds like a vacation to me. That yarn makes me think of the Modern Quilt Movement quilts. Pretty. Makes sense. Recharge those batteries because you’ll be unplugged for a while. That giant yarnball looks like a beehive! I’ve noticed several of these lately hanging in the trees. Whenever I miss you on the blog, I remind myself that a) you don’t really owe us blog time, b) that you’re incredibly generous with your time and sharing your stories, and c) that in order to bring us those stories, you have a life to live. Usually I agree with the priorities you set for yourself. Wishing you a great trip this week. Sounds like an awesome plan. Knit on in peace. So happy you are recharging; it’s SO important! Oxygen mask analog is perfect. Need to remember that one. Cheers! Good for you. Filling your own cup helps you to be the person you want/need to be. I hope you knit the heck out of your quiet time. Smell all the roses you can. Just remember to stop first. Good on you. Fill that cup. I am craving quiet big time. Maybe in ten years when my son finally goes off to summer camp. Sigh. As a mom of three grown children, I pine a bit for those days of their childhood. You will too, but right now need to get a bit of quiet time for yourself. Is there a trusted relative that can visit once a week and watch your child, even for just an hour while you go in another room and knit/read or go for a walk in nature? A nice chat with that relative over a shared cup of tea afterwards, focusing on her will make her day, too! If you treat it like important appointment, just having it to look forward to helps on those exhausting days! And if your child naps, take the first half hour as quiet time for yourself, too! Excellent advice. Moms do not take time for themselves and they need it. Are you kidding me, a MOBILE yarn store! That is genius! Can anyone scream “Franchise!”? Thanks for letting us know the name of the yarn, it’s gorgeous. Odd name, but seriously gorgeous yarn. I could never be a yarn namer, the only thing I could ever come up with is “gorgeous!”. 716 is the Buffalo area code. We Buffalonians used it a lot to connect us together! I agree it should be a franchise, it was amazing. I would ask if I could come join your silence, but that would be totally counterproductive. So I will try to create some of my own this weekend. Brilliant. Smart lady….. enjoy!!! Sometimes quiet is just as important as food/ water/ sleep….. I hope the yarn truck is swamped! Great idea! You’re so gregarious on your blog that sometimes I forget that you’re an introvert, too. Recharging the battery is very important. Good for you! We all need that time. I’m looking forward to some cooler weather myself , to start feeling better – and more like knitting. Have you been to the Cape lately? Pretty socks by the way! Take care. “I never found a companion that was so companionable as solitude.” Thoreau hit the nail on the head with this one. It’s so precious and fleeting! Enjoy your quiet! You have been missed but now that I know what you’ve been up to, you are envied. I think I need to take a page from your book this weekend. Thanks for the reminder! Those socks are beautiful! 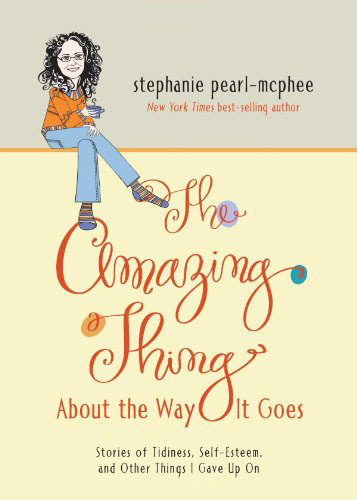 And I just picked up a book from the library all about unplugging. We all want to, we all need to but boy, is it hard. Very wise decision you made. You didn’t have to take the time today either, but you did, and thank you, and take your time till the next hello when it works best for you. That’s a fun sock. Enjoy! I test as 100% introvert, and I quite understand the need for recharging in peace and quiet. Come back when you are ready, and shut out the world when you need or want to. What lovely socks! happy quiet, and happy knitting! Having had a houseguest for 4 days (leaving tomorrow), and even though it’s been a wonderful visit, I am ready for a quiet recharge day. They are so necessary to our mental and spiritual health. Hope you are ready for your next adventure. That is possibly the prettiest sockyarn I’ve ever seen. Quiet time to yourself is always a good idea. As an introvert, it’s something I have to have on a regular basis or I start to lose my mind. Enjoy the quiet! Good for you! I totally can relate. Go, introverts (she said quietly). For those who haven’t yet found it, check out Susan Cain’s Quiet Revolution. I have come to realize in these last 10 years that if you do not take time out for quiet you soul loses it’s ability to communicate with God. He has a lot to say to us and we are just too noisy to listen. We go too much, talk too much, run too much, have the TV on too much, too much computer stuff, games, entertainment and work. We don’t let our souls be quiet. We can’t figure out why we are confused, worried, tired, irritated, numb and just…..a mess, inside and out. I take time in the early morning, even before coffee, which (which is hard but I do it) to be quiet before God and pray. Then the day goes better. Be quiet Steph. You will find creativity and energy to do all you must when you soul gets what it needs first. You of all people deserve a quiet day! When you’re working these days, it involves travel and being with groups of people. Some alone time is important for your mental health. The hardest part of my parents’ marriage was when my father retired. Hang in there. Set some boundaries. Any chance you could find an activity he could go to on a regular basis? I can just imagine how difficult it is to give up you alone-at-home time. At our house, it was I who retired and disturbed my work-from-home-husband. I tried really hard not to apologize for that. Smart lady (as I type from the office on a Saturday – sigh) – but have to ask – mobile yarn store?? For those of us with no LYS, I am SO jealous!! Totally understand!! Take care of yourself!! 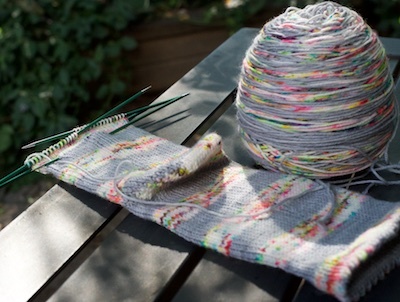 And I love the sock-in-progress, love the stripes of solid with a fun yarn in between. I call it “away time,” and it’s vital to my sanity, so I certainly understand your need to take a respite from the blog to focus (and sometimes, not focus) on you, your work, and whatever else you need and want to do. Also, I desperately need that yarn, so off I go to find it! Im an extrovert, but my job requires me to be talking and interacting with people non stop: calls, meetings, etc. Im so burnt out from ‘noise’ that i drive home in silence- the 40 minutes in the car ‘resets’ me. Enjoy your quiet! Oh, that sock yarn is pretty. And so you should – we ALL should. Go Forth and Knit. And in that vein, Quest for Quiet, I cancelled my landline today. Excellent idea. I’ll be watching to see if it carries over. I hope so. Another introvert here! And my husband and I are both retired – so we made some rules about “private time” and it seems to be working well these last 2 years. Love that yarn and I’ve gotten myself on the list for when she has another dye run for it. I am seeing a slouch hat and matching mittens for myself in that wonderful colorway! I will miss you, but I’m actually surprised you haven’t thought of this before. I also need quiet but I forget that. Thanks for reminding me! The socks look great! You have just confirmed what I have thought when I consider that my “bucket” is empty. I usually feel to guilty to take the time. I’m going to take your post as a wake up call. We introverts need our quiet time! Don’t be sorry, it’s important to have that time. Recently I went on a family vacation, it was great but I wasn’t alone for nine days straight. On Ruesday I had a night all by myself and I literally danced I was so happy. I love the yarn, those should be pretty socks! Are they for the Christmas Box? I love your peaceful grey socks. In fact, I’m at work now listening to a beautiful concerto which is just the kind of quiet, reflective peace (piece!) I think you’re writing about. Best wishes. take whatever time you need for YOU, Stephanie. We’ll all be here when you get back. Just so you know, anytime you say something about how you’re an introvert and you need to disappear for a while to charge your batteries, you give at least one other introvert permission, no, encouragement to do the same. Thank you. I find it ironic that soon my introverted quiet time will be putting a dent in yours. Slightly guilt-inducing… but so very appreciated! See you in Downsville. Don’t be sorry! It’s the best idea ever. We’ll still be here when you get back. Take all the time you need – sometimes quiet is just what the doctor ordered! Love those socks too – so pretty! Quiet time is good. Enjoy! And if you feel a need to post, it can be a picture and a caption 🙂 . As a fellow introvert, I totally get it. I also think you’re very clever! Be still is so important. I try to remember that as I travel through the chaos. Rest when you can! I noticed the beehive effect on the cake of lovely sock yarn. Does anyone know what causes that? Sometimes it happens to me, and other times it does not. Quiet knitting time . . . heaven.